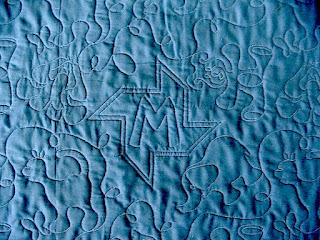 No-sew zones in a pantograph on a large quilt. Note: this gives an overview with some steps included. These notes came from the handout from my class about no-sew zones so I was demonstrating these steps. My chatter would have included additional information. If you are new to iQ, then these notes may leave you with questions - don't hesitate to ask those questions on the Yahoo iQ forum or Friends Using iQ facebook page. I check both often. When there is an area on a quilt that you do not want to stitch over with an E2E pattern, a no-sew zone needs to be created. First set up the pantograph as usual. 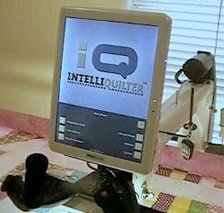 Once the quilt is mounted on the machine, align the quilt image with the real quilt by using the top left corner as the reference point. I prefer to mark the block then later define it as a no-sew zone because I can see where I need to split the pattern and then modify it if possible. If I chose no-sew zone instead of standard block at this first stage, the pattern would be eliminated immediately. Note: If you want to stitch in the ditch around the no-sew zone, you can do this manually as you mark the no-sew zone by lifting the motors and using trace on quilt. Before going any further, zoom in to look at where the no-sew zone crosses over the patterns. Does it cover the whole height of a row? Does it cover part of a row? When the no-sew zone completely covers a pattern row, spilt the pattern anywhere within the block you have just marked. This will eliminate most of the transitions because it has turned one pattern into two. Follow these steps to split the pattern. Finished > add/edit pattern > split pattern. Touch the pattern anywhere within the no-sew zone and then split. When the no-sew zone only partially covers a row, you may still want to split the row so that it can be stitched from the no-sew zone outwards. Alternatively, you may decide that leaving the pattern complete will work better. Look to see if the pattern can be modified slightly to go around the no-sew zone. 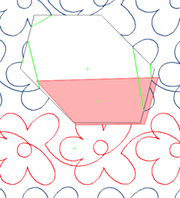 You may be able to eliminate parts and keep the pattern stitching without a transition. This photo shows how I adjusted an E2E pattern to stitch around a no-sew zone. Having split the patterns and perhaps modified them, follow these steps to complete the no-sew zone. Now choose the transition you prefer. If you choose continuous, smooth can be used to modify the transitions. Pay attention to how the pattern will stitch around the edge of the no-sew zone – if there is a lot of backtracking or the pattern is dense; continuous may not be the best choice. If you want to use smooth to modify the pattern, select continuous as the transition for the no-sew zone then when you get to the Design/Sew page, choose add/edit pattern > smooth pattern > touch the row you want to smooth > continue. Grab the start point with the stylus and move it close to the no-sew zone. Grab the end point and drag it close to the no-sew zone. Zoom into the pattern where it is cut by the no-sew zone. Touch smooth and then tap the + sign. Notice how it smooths the sharp corners of the continuous transitions. The other transition choices are tie off and jump stitch. With either one you can eliminate some jumps or tie offs by changing the threshold. The threshold is in inches – if you change it to one inch, IQ will stitch any distance between where the pattern enters and exits the no-sew zone that is less than one inch, as a straight line. It will jump or pause for distances greater than one inch. Your choice of transition depends upon the pattern you are using and your preference. Setting the transition to jump stitch clearly shows where the pattern is cut. Once the transition is set, continue until you get to the design/sew page and select sew quilt. My preference is to sequence the whole quilt when sewing pantographs but when there are no-sew zones, it is better to sequence only the rows that can be can stitched in one pass. The no-sew zones will be marked as you come to them when stitching. This will mean that you will have to exit out of the sew quilt page back to add/edit block in order to mark the no-sew zones, so sequencing only the rows that are affected and about to be stitched is more efficient. If there are multiple no-sew zones in one pass, stitch the patterns between the no-sew zones first then the patterns at the edges of the quilt. 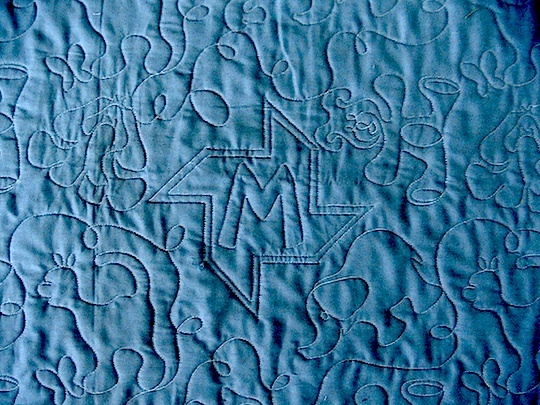 If the no-sew area is larger than the exposed part of the quilt, mark-on-quilt as much of the no-sew zone as possible. Mark the side and top accurately but simply mark a straight line across the base, away from the last row to be stitched in that pass. When you select the patterns to be affected, only touch the rows that are about to be stitched. Do not touch the row that may have a partial no-sew zone. This shows the stitching sequence for the two rows. When you advance the quilt you’ll mark-on-quilt the next part of the no-sew zone. It probably won’t match up on the screen with the part of the no-sew zone that’s already marked but don’t worry. You’ve marked accurately, so it will stitch accurately.